Over the years, we have moved way beyond the conventional data storage solutions such as computer or servers or hard disks as part of disaster management. We are into cloud now, heading towards a digital era where everything is in the cloud. We live in an information-centric world with a growing reliance on creating and consuming data both for personal and home use with businesses and professional needs. As a result, more and more data is being generated, processed, stored and moved for longer periods of time because of which IT organizations are constantly faced with challenges regarding maximizing their resources while overcoming common storage constraints. This is where cloud comes to the picture. Cloud refers to online space that you use to store your personal and professional stuff which is easily accessible from multiple distributed and connected resources. All the data is stored, maintained and managed remotely in logical pools and the whole environment is owned by a hosting company, referred to as cloud service providers. Microsoft OneDrive and Google Drive are the two well-known and widely used public cloud storage services that allow users to store data on multiple virtual servers on a pay-as-you-go basis. While both Google and Microsoft offer fast and reliable cloud storage solutions to both consumers and business users, there are some noticeable differences between the two in terms of structure, pricing model and features. OneDrive is a cloud hosting service for hosting files in the cloud owned and managed by Microsoft. OneDrive, formerly known as SkyDrive, is the Microsoft’s cloud storage solution and service that allows users to have their own virtual storage space, where they can store personal and sensitive files, share files with certain specific people, or choose to make files publicly available. It is the default storage location for Office Online cloud-based apps, and also for Office 2013 applications. Microsoft offers a significant amount of space for free to anyone with a valid Microsoft account so that users can store and access their files from any internet-connected device from anywhere they want. If you want more space, then you have to pay for the extra space. 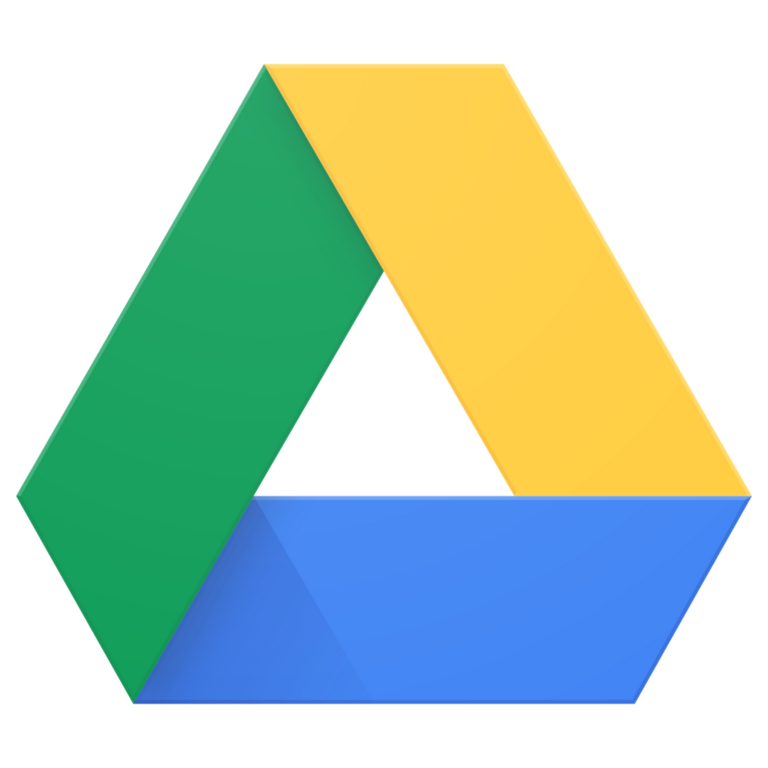 Google Drive, as the name suggests, is a cloud storage service developed and owned by search giant Google that enables users with a Google account store and access files online. Google launched Google Docs in 2007, with limited cloud storage, later transitioning to Google Drive on April 24, 2012. The idea was simple – to create a file in Drive for as long as you want until you have access to the internet and access those files from any compatible device from anywhere you want. Like any other cloud hosting service, Google uses its own virtual cloud known as Drive as a way to tie users into what is broadly known as the Google Ecosystem. – Both Google Drive and Microsoft OneDrive are the two most recognized names in the cloud storage business .Each provide a comprehensive cloud storage solution and structure that would allow users to store their data in network spaces defined by virtual connections between computers hundreds or thousands of miles from their physical location. Microsoft offers a significant amount of space for free to anyone with a valid Microsoft account, whereas Google uses its own virtual cloud known as Drive as a way to tie users into what is broadly known as the Google Ecosystem. – Google Drive is one of the most popular cloud storage systems that provides a friendly pricing model to suit every user. Anyone with a Gmail account has a Google Drive that comes with 15GB of free storage with the Basic Plan. As far as the paid plans go, Google Drive is now Google One with significantly cheaper plans starting with a $2.99 per month plan that gives you 200GB of storage and the 2TB plan now costs $9.99 per month, a significant downgrade from $19.99 per month. The 10, 20 and 30TB plans remain unchanged. Google provides the more sophisticated G Suite plans for business users. Microsoft OneDrive, on the other hand, only provides 5GB of free storage when you initially sign up and you need to pay more for extra storage space. The paid upgrade to 50GB for OneDrive costs $1.99 per month; 1TB costs $6.99 per month ($69.99 a year); and a 5TB plan costs $9.99 which is relatively more budget-friendly compared to Google’s 2TB plan which costs $9.99 for a month. The Business plan is available as a standalone service or included within the Office 365 Suite that also includes Office apps, online conferencing, and email hosting. – Both Microsoft and Google favor their own operating systems, but considering Android is the undisputed leader of mobile operating systems, Google clearly dominates the scene in terms of reach. While both are equally efficient in terms of file sharing capability, OneDrive allows you to set expiry dates on links, which is not possible with Google Drive. In terms of sync abilities, both perform really well though Microsoft has a little edge over Google as long as you’re an Office user. Both Google and Microsoft offer fast and reliable cloud storage solutions to both consumers and business users, allowing users to have their own virtual storage space, where they can store personal and sensitive files, share and retrieve them from any inter-connected device from literally anywhere they want. While both offer same features, Microsoft OneDrive has a little edge over Google Drive when it comes to pricing structure, only when you want to go beyond the free 15GB storage limit. OneDrive provides only 5GB of free storage when you initially sign up, whereas Google Drive offers 15GB of free storage with the Basic Plan. Sagar Khillar. "Difference Between OneDrive and Google Drive." DifferenceBetween.net. 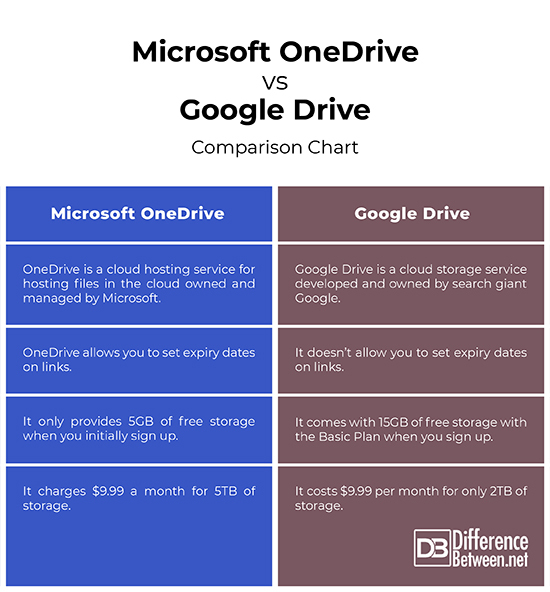 January 17, 2019 < http://www.differencebetween.net/technology/difference-between-onedrive-and-google-drive/ >.